I’m one of the biggest Gilmore Girls fans out there. In a big way, this is because of Lauren Graham’s character, Lorelai Gilmore. And because of this, I picked up Graham’s novel Someday, Someday, Maybe when it came out. I enjoyed it. Graham isn’t just a talented actor, she’s a great writer. When I heard about Talking as Fast as I Can, I got even more excited than I did for Graham’s novel. Turns out, my excitement was warranted. Graham’s fiction is great, but her non-fiction is even better. 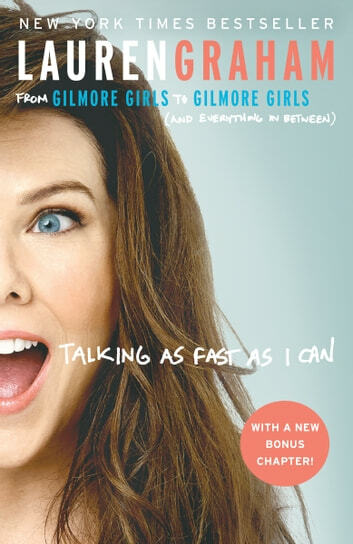 One of my favorite parts of this book was where Graham reacts to each of the Gilmore Girls seasons. It was great to get the actor’s own thoughts on what I’ve watched dozens of times over the last fifteen or so years. And the section where Graham discusses all that was involved in making Gilmore Girls: A Year in the Life happen, I gained a better appreciation for just what went into its creation. But the Gilmore Girls and Parenthood parts of this book weren’t all that made it what it is. Getting to hear about how Someday, Someday, Maybe came to be makes me want to read it again. And hearing about Graham’s early life was also a reason I wanted to read this book in the first place. Being part memoir, part essays on various projects and key issues, this collection is a great read on many levels. I only wish it were longer. I want more from Graham. But I’m happy to wait for another novel or a similar non-fiction book. I’d read anything that comes out. It’s not just my inner fan-girl talking. Graham backs it up with her her writing. As good as Lauren's acting! Very enjoyable book, especially if u know how quirky Lauren is. Wonderful book of conversations and recaps. I loved it! I loved this book. It was entertaining and relaxing to read. It prompted me to watch all of the Gilmour Girls series over again.